In 1980 the Fire Department of Aurora, Illinois, had outgrown the old Central Fire Station built in 1894. Modern quarters were built adjacent to the old station. Much debate raged about the fate of the old fire house that had faithfully served the city for eighty-six years. After sitting vacant for seven years, a group organized to save the old station from the wrecking ball. It would be transformed into a museum and fire-safety learning center. Restoration would take more than a decade and over one million dollars in state and city grants. While the letters “A.F.D. 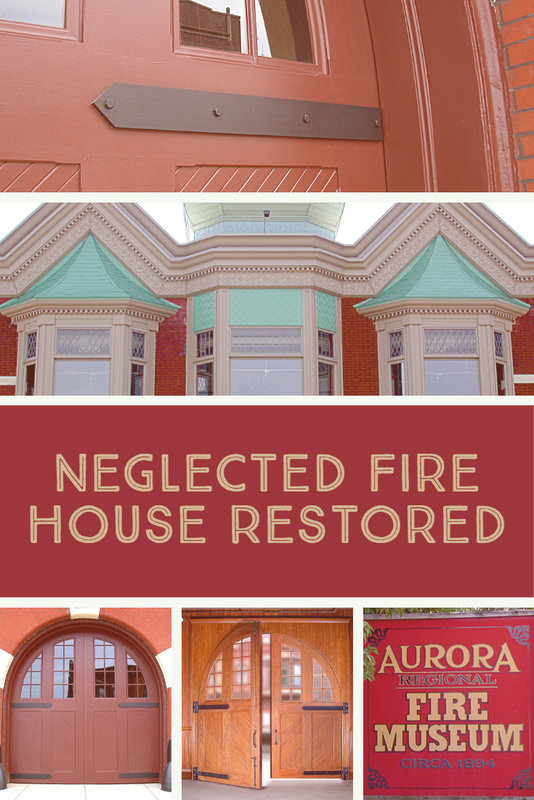 (Aurora Fire Department)” remained on the facade, much of the building’s original character had been lost during the numerous renovations to keep pace with the fire service’s changing technology. Structural deterioration in the basement necessitated major reinforcement before the building could be certified for occupancy to begin the other repairs. Mid-century modernization replaced the beautiful old wooden doors with a more utilitarian overhead garage door and track. In the restoration process these unsightly doors had to be removed and refitted with custom-made replicas of the original doors. Richards-Wilcox was contacted by the project architect and local distributor to help integrate the hardware with the new doors. The project was complex and required Richards-Wilcox engineering expertise to calculate specific weight loads and moment. (Moment refers to how much pressure will be exerted on the pin and pivot point of the doors.) Each of the new arched doors weighed over 600 lbs. This posed concerns about the structural integrity of the front wall and whether the old walls could support the extreme load. Ordinarily doors of this dimension and weight would be supported by at least three hinges. However the unique design of the swinging, arched, and window-filled doors made it impossible to install more than two hinges. Custom modifications had to be made to install steel support frames around each opening. An added complication required the doors to swing inward. This called for the door hardware to be mounted on the interior of the door, rather than front street-facing side. Because the front doors were to have very high visibility from the street, it was unacceptable to have a standard back plate with bolts noticeable on the exterior. Richards-Wilcox designed special hinges and back plates that mimic the look of a hinge on both sides of the door. A wrought iron powder coating finish gave the hinges the effect of antique hardware circa 1890. Final installation of both sets of doors required weeks of hard work, but the result was spectacular. Not only do the incredibly large and heavy doors swing open with the touch of a finger, but the craftsmanship of the entire ensemble is remarkable. The dramatically different faÃ§ade was restored to its former splendor. In November, 2003 the Aurora Regional Fire Museum celebrated its grand opening with active and retired fire service men and women, city officials, and supporters including Richards-Wilcox who helped with a sponsorship. Once again the Aurora Regional Fire Museum stands ready to serve and commemorate those that dedicate their lives to our safety.